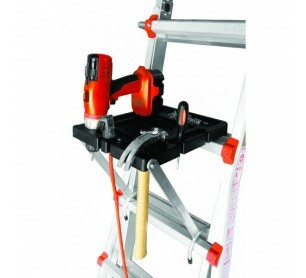 Little Giant Ladders project tray - Model 15012-Project Tray. The Project Tray is the latest multi-use ladder accessory from Little Giant Ladder Systems. The Project Tray, which works on any Little Giant Ladder System's multi-use ladder, offers one convenient location for all of your tools. The Project Tray includes slots for power cords, screwdrivers, knives and other tools- recessed trays for any size of paint containers (round quart and gallon, and square gallon)- and a magnetic dish for loose nails, screws, nuts, and bolts. It can even hold your drink while you work. The Project Tray is rated to hold up to 25 lbs. in materials. Keep your tools handy and get the job done faster. Prevent accidents and paint spills with custom-fitted paint container slots. Never lose another nail, screw, nut, or bolt with the Project Tray's magnetic dish. Hang extension cords, drills, screwdrivers and any other tool from the Project Tray's fitted slots.